If Bank of England Approved LIBOR Rate Manipulation, Will Mervyn King Resign? Bankster's, such as Bob Diamond have just started to play their Ace card that they have held close to their chests for near 4 years now. That Ace card alledges that the Bank of England gave a nod and a wink to manipulate the LIBOR interest rates lower on several occasions during credit crisis extremes when the interbank lending market had effectively frozen. and it should not be forgotten that Quantitative Easing (QE) of £325 billion to date has been for the purpose of manipulating market interest rates lower across the yield curve, all the way from short LIBOR right through to the long dated Government Bonds. This is a FACT, the Bank of England has manipulated the market interest rates lower between banks and for government bonds but not for retail customers. The following video from Jan 2009 should remind readers of the real reason why LIBOR is manipulated and why there will be many more instances of market manipulations and financial rules and regulations being broken that will be revealed over the coming years because when one is on the edge of financial armageddon, literally anything goes, the Bank of England, politicians and FSA will all have given many nudge and a winks to the banks. 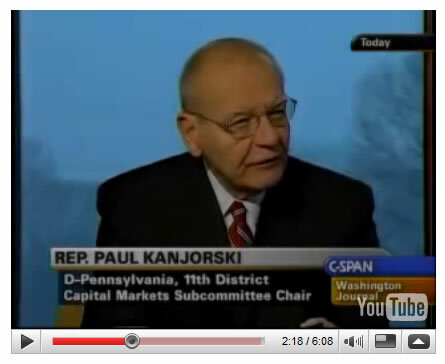 At 2 minutes, 20 seconds into this C-Span video clip, Rep. Paul Kanjorski of Pennsylvania in Jan 2009 explains how the Federal Reserve told Congress members about a "tremendous draw-down of money market accounts in the United States, to the tune of $550 billion dollars." According to Kanjorski, this electronic transfer occurred over the period of an hour and threatened a further $5 trillion to be drawn out triggering a total collapse of the Financial System, which prompted Hank Paulson's emergency $700 billion TARP bailout action. Therefore the Bankster's at the likes of Barclays and all major UK banks took the nod and a wink from the Bank of England to lower LIBOR rate submissions so as to give an illusion of solvency during times of credit crisis extremes, that they increasingly used and abused to boost profits to the cost of interest rate derivatives counter parties (usually other banks), as they always had a get out of jail card. If Bank of England senior staff sanctioned manipulation of LIBOR rates, then so ultimately one of the heads to roll could be Mervyn King's as the Governor of the Bank of England. Off course others to have known or even directly sanctioned LIBOR manipulation "prevent financial armageddon by any means necessary" would have been the previous Prime Minister Gordon Brown ( who the public sacked him from office 2 years ago), so the Bank of England will have their own Ace card to play that will point back to Alistair Darling and Gordon Brown whether they realised the consequences of what they were requesting at the time or not! However, today's government may attempt to veer investigations away from the Bank of England because of the important role the BoE plays in the monetization of government debt and the potential consquences if the markets lose confidence in the Bank of England (I smell the potential for the mother of all coverups). The Real Problem is that the bankster's continue to run rings around politicians and regulators because they have imbedded themselves so deep into the system that the know the politicians cannot survive without them, because the politicians rely on the bankster's to bankroll the deficit with the tax payers OWN money ! That is how our political / economic system functions - Politicians rely on the Bank of England to print debt / money to finance the huge annual budget deficits (£130 billion per year) so as the party in power can buy votes, to achieve this the Bank of England encourages the banks with cheap money (QE) and capital requirements to buy government debt with the FSA playing its role by employing ex-bankers that employ light touch regulation so as the government can achieve it's objective of continuing its confidence game Greece style of an ever increasing debt mountain at ultra-low sub inflation interest rates. 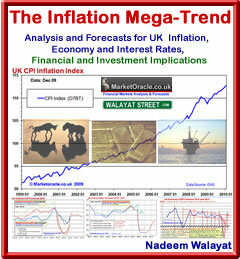 However there is a price to be paid for this money / debt printing confidence game and that is INFLATION. Ultimately this achieves the bankster's goal of turning everyone and everything into a debt slaves and for the party in power to maximise its chances of getting re-elected as they buy votes with borrowed money just as Gordon Brown did at the last election and just as David Cameron will attempt to do at the next election, which means the system will only ever be tinkered with around the edges until there is a REAL revolution! So get ready for another round of inflation inducing money printing of £50-75 billion for the banks to buy government bonds possibly as early as Thursday of next week! So much for holding bankster's to account, instead they will be stuffed with even more cash! Instead, if the Bank of England did not primarily work to serve its bankster brethren, the £75 billion could actually boost the economy if the 28 million tax payers each received a tax refund of £2,678!